With Girl Scouts, you will make new friends and have a ton of new experiences that show how exciting the world is. Start the fun, today! Through the new Extended-year Membership option available from April 1 through June 30, 2019, new Girl Members (entering grades K-12, Fall 2019) and new Adult Members (parents, volunteers, and troop leaders) can register for an up to 17-month-extended-period ending Sept. 30, 2020. Extended membership costs $56 for girls (and $35 for adults), and allows you to begin your Girl Scout Leadership Experience now, as of April 1, and continue through the summer right into the traditional troop experience in the fall without paying double membership fees. It’s seamless—and a pretty sweet deal! Check it out. 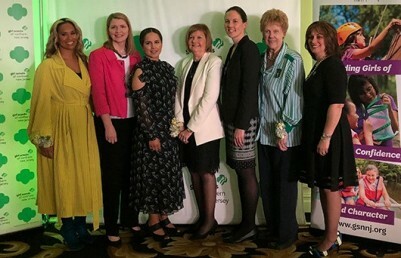 GSNNJ was honored to pay tribute to some exceptional female leaders and innovators from northern New Jersey at our recent Women of Achievement 2019 event. Thank you to our sponsors and to those who attended, donated, or participated in our Silent Auction to show their support! No mask or cape needed: Girl Scout volunteers are the everyday superheroes who make a real impact! From igniting curiosity to inspiring girls to dream big, our volunteers are the reason we’re the largest leadership development organization for girls. Thank you for all the AMAZING work you do, during Volunteer Appreciation Month and every day after! First Lady of New Jersey Tammy Murphy salutes Girl Scouts in an Opinion column during Women's History Month and NJ STEM Month.